There is still a Rectify without Daniel Holden. There would have to be: For the viewer to truly believe that Paulie, Georgia is this thriving organism that existed, evolved, and found a new equilibrium while Daniel was away in prison, we need to accept the fact that this world keeps spinning without him. To me, that’s the idea behind the first two episodes of season two. With the show’s protagonist in a medically induced coma, his family and neighbors keep inching forward, just as they did when Daniel was on death row. In order for us to truly grasp the changes that occurred while Aden Young’s character was away, Rectify shows us the incremental changes that occur while he’s laid up in the hospital. That said, there is the impression that these opening installments of season two document satellites spinning out of orbit without Daniel’s gravitational pull. The characteristics that make Rectify great are still present in “Sleeping Giants”: Abigail Spencer and Adelaide Clemens both give moving performances this week. There are keen conversations about faith and belief (in a higher power as well as your fellow man). There’s photography that’s stunningly composed (Jon and Hollis, filmed overhead to turn the visitation partition into a visual metaphor) and effortlessly artful (Amantha, seated on the hospital curb, folding into herself as fallen leaves blow past). But it can also feel like channel-surfing through a series of separate, varyingly bleak, Southern-set dramas—until it’s all pulled together by that final montage. While Daniel wakes up, his raw throat no hurdle to razzing his closest family members, Sheriff Daggett escorts Bobby Dean to a squad car. While one mother gets her son back, another loses hers. Change occurs, and once more Paulie shifts to accommodate that change. It’s good to have you back, Daniel Holden. Without that unifying presence, “Sleeping Giants” threatens to scatter like those crisp autumn leaves that tumble by Amantha’s feet. We’ve spent a good amount of time with all of the characters that surround Daniel, but the tones of their individual storylines don’t always mesh. Tonight, Tawney and Ted Jr. star in a devastating domestic drama about a marriage that’s slowly unraveling. Daggett and Bobby Dean are in a Columbo-style inverted mystery, wherein we know the culprit, so there’s no time wasted on pretending like Bobby wasn’t the orchestrator of Daniel’s beating. 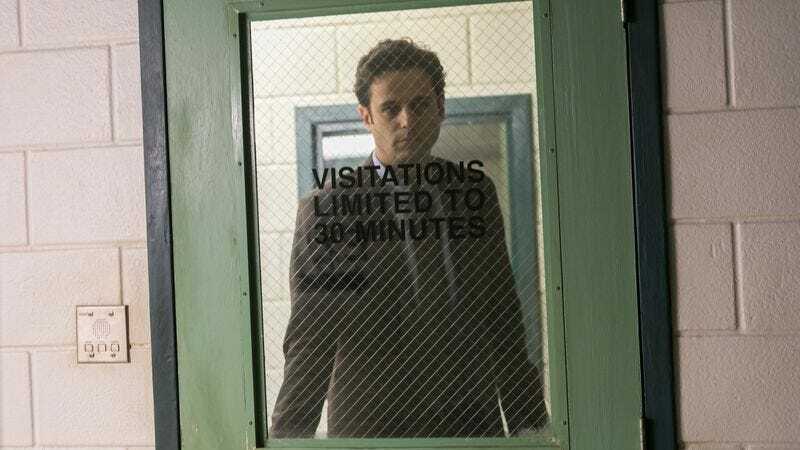 In the first we’ve seen of Luke Kirby this season, his Jon Stern stars in a dispiriting portrait of the American justice system. The days between the end of the last season and the beginning of this one look like they’ve worn the most on Jon, who’s so bleary-eyed as he walks through the Get Smart-style security system at the Oklahoma Correctional Institute that it causes the camera to fuzz out. Jon, a talented attorney who’s built a reputation on sentences vacated via DNA evidence, has finally lost an appeal. The client feigned innocence, but traces he left behind at the crime scene contradicted his story. People lie, but in the eyes of the court, DNA always tells the truth. This being Rectify, the killer is at least allowed to express how much he loves potatoes. Actions have consequences in this world, and those consequences weigh on Jon Stern as much as they weigh on Bobby Dean. His criminal coverup is undone by more ancient means: An eyewitness, a young boy who was at the cemetery at the time of Daniel’s attack, identifies Bobby as the unmasked ringleader. Actually, the show is more oblique than that, because young Stevie (whose age and nearby grape soda reinforce the notion that there’s no innocence to be found in Paulie) points toward a photo that the camera doesn’t show. The interview’s on tape, so there’s no way Daggett hauls Bobby in on speculation and suspicion alone. But it’s worth noting that the show doesn’t need to confirm what we already know: That Bobby Dean doomed himself by pulling down his mask at the end of the attack. By virtue of his relationship to Hanna Dean, Bobby would always be a suspect in this case, but one tiny action brings him from “suspect” to “culprit.” He does himself no favors by displaying his comfort with public urination outside the local bar. With the reverberations of what Daniel did or did not do 20 years ago out of the conversation for one more week, the decisions made by other characters in season one have greater impact in “Sleeping Giants.” Rectify doesn’t forget, and that widens the gulf between Ted and Tawney, their big confession sequence blocked to show how much distance can exist between two people who are in the same room. It’s a neat mirror image to Jon and Amantha’s phone conversation, in which the physical distance between the characters is legitimately vast. There’s an emerging pattern in these episodes—one that I predict will escalate now that Daniel’s awake—of tension within the fragile Holden-Talbot relationship. There’s a prodigal son arrangement brewing between Daniel and Ted, as Ted’s resentment regarding Daniel’s return (and any lingering scars from that “Drip, Drip” assault) spills over into his interactions with his wife and younger brother. To find Jared fiddling with Daniel’s Walkman is one thing; learning the truth about Tawney’s emotional-and-intellectual crush on his stepbrother is a bridge too far. Saving the tire store is Ted Jr.’s mode of retreating into the past and isolating himself from the chaos swirling around his family—but at this point, all he can truly muster is the straight-up retreat he seeks in the bathroom at episode’s end. More than any other character on Rectify, Ted Jr. seeks a return to normalcy—which puts him unwittingly close to the man at the show’s center. And now that Daniel is back in the “land of the living,” it’s time for the show to confront those similarities head on. That’s the other exciting aspect of “Sleeping Giants” conclusion: Daniel waking is a sign that the story of the second season can truly begin. It’s frustrating that the show essentially put itself on a two-episode delay, but Ray McKinnon and his team have more real estate to play with this year, so why not try out an extended, slightly unmoored preamble? It wasn’t fully successful, but this week’s installment points toward positive developments in the future. Because the title of “Sleeping Giants” is pluralized for a reason: Daniel has stirred, and that stirring will ripple throughout the remaining eight episodes. But something has awoken within Ted as well, and that could have repercussions well beyond the Talbot-Holden household.